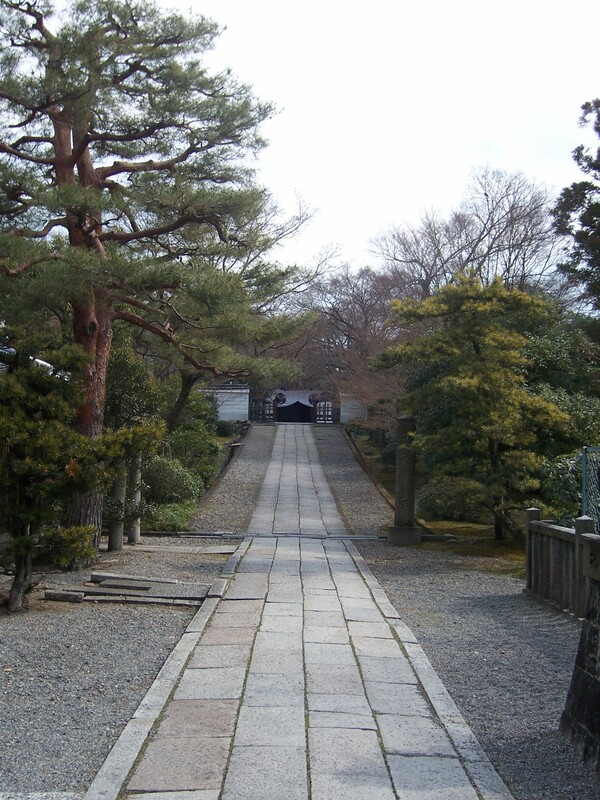 It was at the beginning of March 2008 during my year as an exchange student at Osaka University when I went to Kyoto to explore the city on my own for a whole day. Actually, I didn’t plan to be on my own there, but due to a misunderstanding, I suddenly had plenty of time to kill, which is pretty easy to do in Kyoto with its uncountable tourist spots. The weather was fine as well, so I walked from Shijô-station alongside Kamogawa to the south. Although I was heading in the direction of the National Museum, the weather was too good to spend the day inside and I decided to have a look at the many temples nearby. Among them was the famous Sanjûsangen-dô which contains one thousand statues of Kannon, but as I had too much time anyways I wanted to see the small temples right next to it as well. 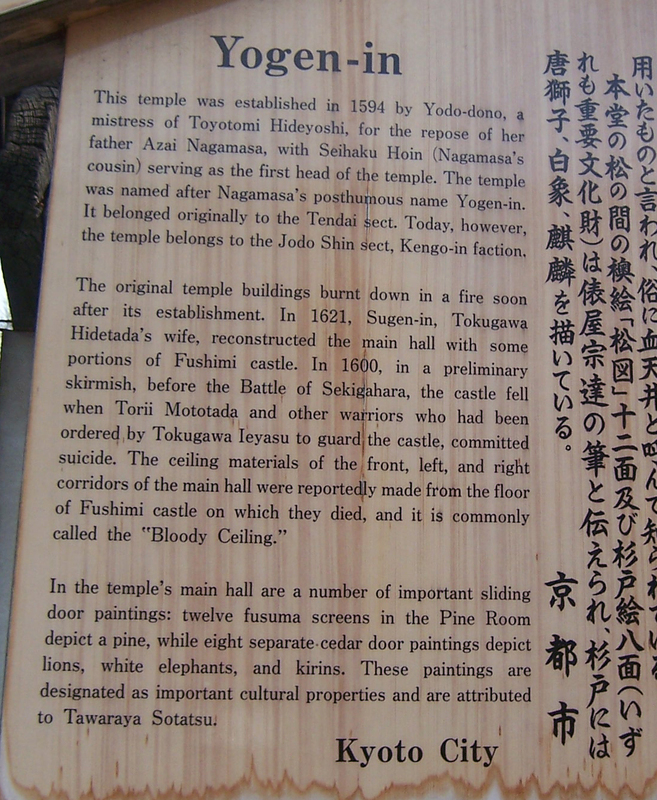 One of them is Yôgen-in, which comprises a wooden ceiling littered with blood, because the wood was taken from a floor of Fushimi Castle, where the castle’s defenders including Torii Mototada committed suicide as the castle fell. So it said on a sign in front of the temple written in Japanese and English. Due to the fact, that the sign had an English explanation as well, I was quite confident that this was an invitation to tourists to go inside the temple to see the historic wood. In the meantime, a Japanese couple came out behind the wall. As they saw my helpless attempts to address the baba, they asked me what the problem was. While the woman then started to explain some historical aspects of the temple to me, her husband had a discussion with the baba. But neither could he find out why I wasn’t allowed to enter nor convince her that I wouldn’t destroy the precious room. Even their offer to accompany me to make sure that I wouldn’t do anything to the temple was denied. In the end, the couple gave up and told me that this baba was just “baka“. 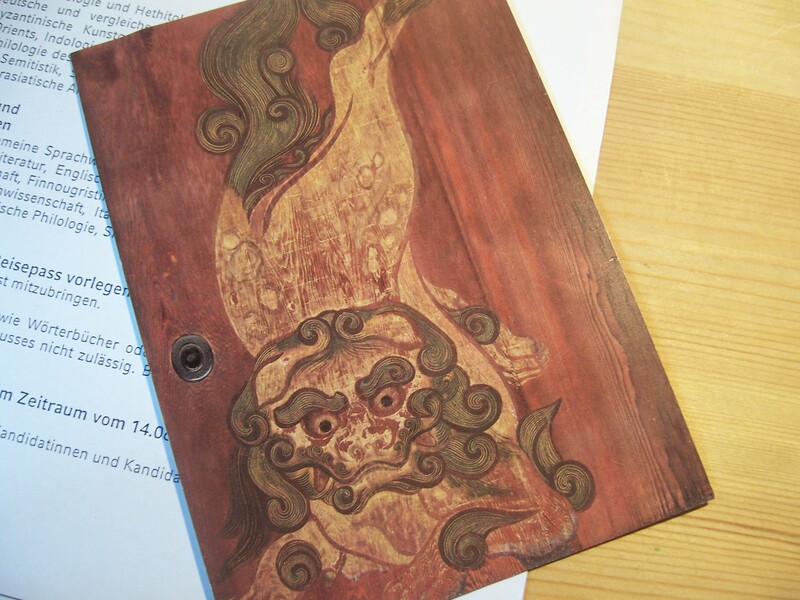 On the way out of the temple we had a very nice conversation and the woman was so kind as to give me a post card depicting the sliding door painting of a lion. This post card is all I could see from the inside of this temple, so to me, the bloody ceiling of Yôgen-in is Japan’s best kept secret kept by the nation’s best secret keeper. 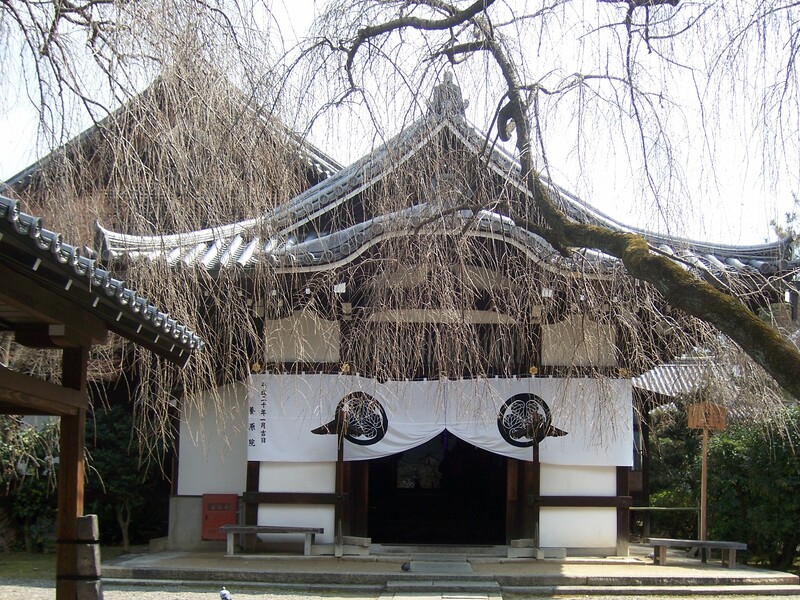 This is an entry for this month’s Japansoc Blog Matsuri “Secret Japan” hosted by gakuranman. Wow…I’ve not encountered that level of hostility before. Sorry to hear you had a rough time. But it was pretty nice of that couple to try to help you out, at least. I’m headed to Kyoto next week. Maybe I’ll see if I can get in (my Japanese isn’t that great, but my wife’s a native…). Well, you find those babas everywhere and the couple was really great, so after all I still think this kind of hostility is very rare in Japan. Very interesting. I’ve always found the fact that some Japanese are so anti-foreigner fascinating. I did take one Japanese history course, but I haven’t researched their history, or the social aspects of it, too thoroughly. So, my guess is that this is a passed down mentality from the time when Japan had sealed itself off from foreigners and considered themselves to be superior to the rest of the world. I think it’s odd that some Japanese would maintain that mentality even after Japan was defeated and had their entire government rearranged by a foreign power. Of course, Japan isn’t the only country with ultra-nationalism, so maybe it’s not so strange after all. I also don’t think that this is strange and definitely not exclusively Japanese… My experience rather tells me that some people of the generation which lived through ultra-nationalism still keep nationalistic thoughts. I think, it’s not easy for them to get off these thoughts which got implemented during their childhood or youth. And I thought that Japanese are a friendly bunch to hang out with and still they are some who keep those nationalistic values? Shouldn’t those values to be left behind and join into the global world? We are all the same beneath so what’s the point of not giving permission of other than Japanese to go in. Older people in every country I’ve been to have very different social attitudes towards all sorts of things. I would be curious as to why the no-foreigners rule came to be in the first place. I doubt that they decided from the get go to enforce such a policy, perhaps she’d had to deal with some reckless other foreigners in the temple before – you know what they say about a few bad apples. Definitely an awesome find though. I wonder if I’d get the same treatment if I were together with my Japanese girlfriend. It’s one thing to deny some couple that you had not met previously from bringing you in, but it would be really putting them on the spot if you were actually there with your Japanese spouse. “Cranky Store Clerk Syndrome” – “known to have originated” in Paris, France, but by now an universal phenomena, no less forgivable or excusable. Baba-san is too old to re-train, I suspect. What a great story to come out of a situation too silly for words! I can’t believe that you weren’t allowed in. What did she think you were going to do whilst in there? And you’re right, you would have thought the English description would have denoted that people’s who native language is English would be permitted access. Oh Japan, how I love your quirks. Hopefully one day somebody will get in so we can all have a look at the ceiling! Maybe I just had bad luck when I tried to enter at a day the baba was in charge… Otherwise I couldn’t understand why they put an English description there. And yeah, I wonder what she was thinking. Did I look so mischievously?? Anyways, thanks for the comment! Having just been to Yogen-in I might be able to shed some light on this incident for you as I, too, am a foreigner. The temple provides a guided tour of the rooms. You proceed through it in groups while listening to a Japanese-language audio cassette that they carry from room to room that tells you about the history of the building (maybe an explanation for the baba’s “Japanese only” comments?). About mid-way through the tour a monk will lead you through the latter half, giving it a more personal feel. The entire tour lasts about 20 minutes. We were there for at least double that time and I didn’t see anyone, Japanese or foreign, being permitted to wander about from room to room on their own. They always proceeded from room to room in groups, in a specific order. That’s very interesting. I don’t think they had audio guides or tours when I visited the temple three years ago. Neither did I see anyone carrying audio guides nor was there any information on tours. And I think the Japanese couple who tried to help me would have told me if there where tours.